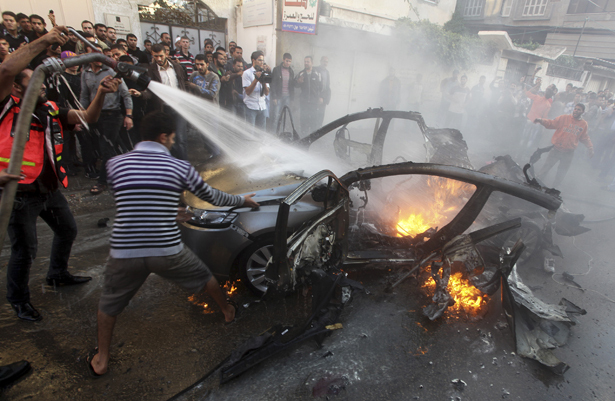 Israel's air force assassinated Hamas leader Ahmad Jaabari. As the Israeli airstrikes continued today, seven more Palestinians were killed and at least 30 were injured, ten critically. Yesterday’s Egyptian-brokered cease-fire between Gaza and Israel collapsed today when Israel launched a major escalation. In airstrikes almost certainly involving US-made F-16 warplanes and/or US-made Apache helicopters, Israel’s air force assassinated Ahmad Jaabari, the longtime military leader of Hamas. As the Israeli airstrikes continued today, seven more Palestinians were killed and at least thirty were injured, ten of them critically. Jaabari had been chief negotiator with Israel in the deal that led to the release of captured Israeli soldier Gilad Shalit in exchange for the release of more than 1,000 Palestinian political prisoners held illegally in Israeli jails. He had negotiated the cease-fire that had mostly held over much of the last year or more. The attack, code-named “Operation Pillar of Defense” [sic], also killed someone else in Jaabari’s car, and quickly expanded with additional airstrikes against Palestinian security and police stations in Gaza, making it impossible for Palestinian police to try to control the rocket-fire. So why the escalation? Israeli military and political leaders have long made clear that regular military attacks to “cleanse” Palestinian territories (the term was used by Israeli soldiers to describe their role in the 2008-09 Israeli assault on Gaza) is part of their long-term strategic plan. Earlier this year, on the third anniversary of the Gaza assault, Israeli army Chief of Staff Lt. Gen. Benny Gantz told Army Radio that Israel will need to attack Gaza again soon, to restore what he called its power of “deterrence.” He said the assault must be “swift and painful,” concluding, “we will act when the conditions are right.” Perhaps this was his chosen moment. It is an interesting historical parallel that this escalation—which almost certainly portends a longer-term and even more lethal Israeli assault—takes place almost exactly four years after Operation Cast Lead, the last major Israeli war on Gaza, which left 1,400 Gazans dead in 2008–09. Then, as now, the attack came shortly after the US presidential elections, ending just before President Obama’s January 2009 inauguration. But the timing for this escalation is almost certainly shaped more by Israel’s domestic politics than by the US election cycle. The most likely timeline is grounded in Netanyahu’s political calendar—he faces re-election in January, and having thoroughly antagonized many Israelis by his deliberate dissing of President Obama, needs to shore up the far-right contingent of his base. With regional pressures escalating, particularly regarding the expanding Syrian crisis, Netanyahu needs to reassure his far-right supporters (an increasing cohort) that even if he doesn’t send bombers to attack Damascus, he still can attack, bomb, assassinate Arabs with impunity. There is a US connection, of course—however much domestic politics motivated Tel Aviv’s attack, Israel’s backers in Congress (lame-duck and newly elected) will still demand public US support for the Israeli offensive. Netanyahu will get that backing—there is no reason to think the Obama White House is prepared yet to challenge that assumption. But it’s unlikely that even Netanyanu believes it will somehow recalibrate his tense relationship with US by forcing Washington’s hand to defend Israel’s so-called “right of self-defense.” They will do that—but Obama will still be pretty pissed off at Netanyahu. As is always the case, history is shaped by when you start the clock. In the last several days, US media accounts have reported increasing violence on the Gaza-Israel border, most of them beginning with a Palestinian attack on Israeli soldiers on Thursday, November 8. What happened before that Palestinian attack? For starters, the soldiers, part of an Israeli Defense Forces (IDF) squad that included four tanks and a bulldozer, were inside the Gaza Strip. According to the IDF spokeswoman, Palestinians fired at “soldiers while they were performing routine activity adjacent to the security fence.” Really. What kind of activities inside the supposedly not-occupied Gaza Strip, by a group of armed soldiers, tanks and a bulldozer (almost certainly an armored Caterpillar D-9 bulldozer manufactured in the United States and paid for with US taxpayer military aid to Israel), could possibly be defined as anything close to “routine”? Unlike the illegal Palestinian rockets fired against civilian targets inside Israel, using force to resist an illegal military force in the context of a belligerent military occupation is lawful under international law. Later that day, an 11-year-old child was killed. Israel was “investigating the boy’s death.” Not many US media outlets reported that within the next seventy-two hours the Gaza-based Palestinian Center for Human Rights documented five more Palestinians killed, including three children, and fifty-two other civilians, including six women and twelve children, wounded in Israeli airstrikes. Four of the deaths and thirty-eight injuries resulted from a single Israeli attack on a football playground in a neighborhood east of Gaza city. Twelve Israelis, four of them soldiers, were injured by Palestinian rockets fired into Israel. The cross-border clashes continued, until Egypt was able to negotiate a ceasefire on Wednesday. Today, that fragile ceasefire was violently breached as Israel sent warplanes to assassinate a Hamas leader and destroy key parts of Gaza’s barely functional infrastructure. This is primarily about Netanyanu shoring up the right wing of his base. And once again it is Palestinians, this time Gazans, who will pay the price. The question that remains is whether the US-assured impunity that Israel’s leadership has so long counted on will continue, or whether there will be enough pressure on the Obama administration and Congress so that this time, the United States will finally be forced to allow the international community to hold Israel accountable for this latest round of violations of international law. For more on Middle East affairs, check out Robert Dreyfuss’s blog.